For 2019 I’ll be busy decorating my new home. Right now color and basics are important. Not every decor accents go with your decor. Having that perfect accent can add that extra something that is missing from decorating. Whether it’s a candle or vase I love these accents I found. The key to them is they are a neutral and classic look. Later on, if I need more color I can add it. This gold cart is super popular for decorating. It has that a vintage look and looks great in any space in your home. It great for the entertaining in small or large spaces. Throws and pillows are probably one of the hardest to style for me. I’m planning on using many of them in the new home. I am going to start off with a classic white furry throw and once the basics are done. Planning on adding some pretty colorful pillows at the end. I love this fun way to say thank you to all of our readers and I am happy to hostess this giveaway for you too! 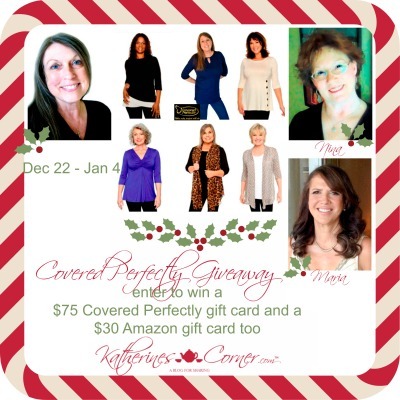 One winner will receive a $75 dollar gift card for Covered Perfectly and A $30 gift card for Amazon too. The prize is provided by Katherine, Covered Perfectly, Simple Nature decor and Vintage Mamas Cottage. I love the V neck! Slimming and pretty!! I love the V neck ! So slimming and pretty! Thanks its a great look. Thanks, it’s an awesome giveaway. I like the “PERFECT LONG SLEEVED TEE SHIRT” from the Covered Perfectly shop. Excellent coverage and great for layering! I like the cascading vest. Thanks for the giveaway. The Vests are amazing. Thanks for entering. I’m really liking the CLASSIC HENLEY WITH A-LINE BODY. Love how it tapers at the waist to give it a nice fit. I like the LIGHTWEIGHT COTTON CARDIGAN JACKET. Sounds amazing. I love that one too. Thanks for entering. I love the FLOWY LIGHTWEIGHT JACKET! It’s beautiful! I really like the fun and flirty fit and flare. I like the Classy Two-Toned Woman’s Top in black-malt. Sounds like a really nice top.